Esta entrada se publicó en barcelona, refarm y está etiquetada con app, hardware, tools en 27/07/2018 por hernani. next weeks are full of activities: first we’ll start a 2 week workshop to build together our exhibition. the idea is that people can enter inside a house and visualize what tools do they need to sustain urban agriculture on their home. we started to planning this 2 months ago so now we have almost all the materials and tools needed but also a small community of 8 people willing to join this build together workshop. and we’ll start tomorrow with a tour on the neighborhood get screws and reclaiming materials such has wood, containers and home appliances. we made already a draft of what we need to build and draw. we’ll document our process, has always, but posting will be erratic since in china we can not easily access to our blog.. wunther why..
mei mei, our producer :) dealing with prices.. here things never have a price, you must always negotiate. Esta entrada se publicó en beijing y está etiquetada con bjdw, design, hardware, materials en 18/09/2014 por hernani. today we started our two days tour over barcelona city trash. first stop: Solidança on our workshops we always have this idea of building with what’s available and every city has their own trash dinamics and trash resources. and barcelona would not be different. Talking with Isabel Gimeno from Solidança we both aggre that after joining EU there was a big efford on regulate the trash and since then we have a strong environmental protection policy and a cultural conscience started to grip. I’m a caver since 14 and I’ve saw many weels and deep caves filled with all sort of trash: cars, medicines, sick cattle, cloth, batteries, electronics, house and industrial sewage, just to name the ones you can quikly identify.. me and caves al over the world have spend incontless hours cleaning this mess many times preventing or at least reduce the inevitable water contamination that occours with this human behaviors. lucky in recent years we don’t see has many trash on the caves and generaly dumped next to a river flow. we have became cleaner in europe but we still have many unresolved problems: stuff that is impossible to reuse or recycle, lack of design for disassembling or designed to be imposible to repair, over consumering etc Solidança, apart of managing 4 big collection centers, brings new value and meaning to coth, electronics and house appliances. Solidança also has a strong social commitment. giving workshops of waste managment, electronics and electrical appliances reparation, gender equalty, new tecnologies, social competences, etc. Solidança also reseaches new protocols and systems with this idea in mind: work to reduce poverty and protect the environment. we were warmly recived by Miquel Caballé and Isabel Gimeno who gave us a quick tour and a long chat :) we then went strait to what was waiting for us: 60 washing machines. and this is the final result: 6 pressure switches, 2 water pumps, 6 electro-valves, 1 flowmeter!! and several other things to you know.. hack :) we ended the day with Merce Jara (tks for all ;) with a suprising tour to l’Hort Fort Pienc. Esta entrada se publicó en barcelona y está etiquetada con economy, electronics, hardware, iaac, materials, workshop en 22/05/2014 por hernani. we also debate and advanced a bit more on the electronic board “mini vacations” with thiago. in a couple of weeks we’ll send them to the press. 3 packs: one to barcelona, one to san francisco and other to rio de janeiro. surian will get the boards in rio so if you what one ask him :) surian was also involved on the next project the #5: monitoring of the composter built by joaquim. surian documented everything here. well “galera” (bruno, chintia, julia) I think it was the best and the most immerse interactivos? that I ever have been.. I’m sure that medialab_prado is proud of you and how you worked the open model of interactivos workshops ;) congratulations!! we will continue our development on the 3D printed e-faucet and the other projects. expect more news soon. 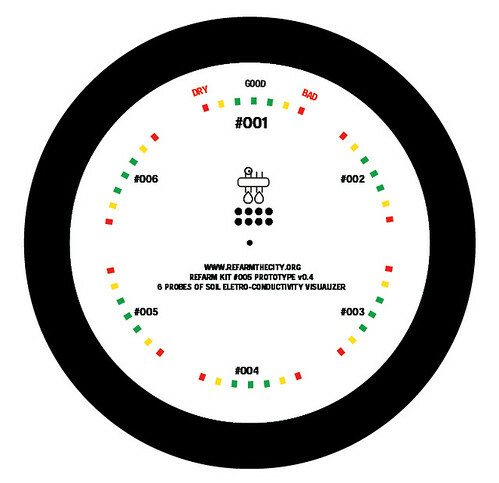 Esta entrada se publicó en refarm, rio de janeiro y está etiquetada con art-residency, call, design, hardware, project, update en 24/09/2013 por hernani. do no were to start :) maybe for the morning face washing on the river that flows on nuvem..
and here a visual resume of the last days. then we design a mechanism that can be adapted to the faucet. this one is moved by a servo motor. Esta entrada se publicó en refarm, rio de janeiro y está etiquetada con art-residency, call, design, hardware, project, update en 11/09/2013 por hernani. no much news from today. we had presentations all day, proposed projects, collaborators, lines of work, planning, arrange the physical space, team first impressions, unpacking etc. Esta entrada se publicó en refarm, rio de janeiro y está etiquetada con art-residency, call, design, hardware, project, update en 07/09/2013 por hernani. uau!! 2 lines that made us jump of joy :) so next september you will find us in brasil developing a electronic faucet/valve that can be made in a 3D printer. here you can see our proposal. Esta entrada se publicó en refarm, rio de janeiro y está etiquetada con art-residency, design, development, electronics, hardware, invitation, materials, project, water en 12/08/2013 por hernani. creio que é o primeiro post que escrevo em português :) ontem apresentámos a nossa proposta para uma residência artística na nuvem.tk a ideia era formalizar a nossa colaboração com a UFRRJ no desenvolvimento do sistema de rega de baixo custo, conhecer a nuvem e poder contribuir para um projecto que busca uma harmonia entre humanos e biosfera e obviamente hihihi poder voltar a participar num interactivos! trabalhar com gente nova e que sabe mais de “outras coisas” :) a nossa proposta é por um lado ligar o sistema de rega a uma placa de refarm para que possamos recolher dados e enviar-los aos nossos servidores e por outro lado desenvolver componentes específicos (uma torneira) de codigo aberto. olhando para o sistema UFRRJ há 3 componentes que são difíceis de encontrar globalmente ou que diferem radicalmente de cidade em cidade. outros não :) por exemplo o presostato é um componente global. em todas as cidades que fomos sempre encontrámos máquinas de lavar a roupa donde era possível retirar o presostato e de regular os mecanismos internos para que funcione com a pressão requerida 1KPa. no caso da electro-valvula/torneira/mecanismo-de-fechar-um-circuito-de-agua não conseguimos encontrar uma fonte regular deste componente nas cidades. primeiro porque genética de refarm: como fazemos oficinas não trabalhamos com altas voltagens e as valvulas que mais encontramos são as das maquinas de lavar roupa/louça. estas são todas a 110-220V ac. a voltagem comportável para trabalhar com todas as idades é entre 3-5V dc. segundo porque não encontramos frequentemente electro-valvulas de baixa voltagem.. há umas numas impressoras profissionais, outras numas máquinas de café, outras na nautica, mas não é um componente comum a nivel global. esta é a nossa proposta concreta para a nuvem, desenvolver uma “e-torneira” para ser reproduzida localmente com uma impressora 3D. o outro componente intrigante é o sensor de cerâmica. este componente tem muitos desafios pela frente antes de chegar a ser um objecto que possa ser reproduzido segundo as matérias primas disponíveis nas cidades. Esta entrada se publicó en refarm, rio de janeiro y está etiquetada con art-residency, call, hardware, project, university en 02/08/2013 por hernani. it’s our new mini vacations board V3. the mini is meant to control the UFRRJ watering system, collect/store data and has an optional wireless data socket to upload data or change configurations. contents: ATMEGA328, EEPROM serial 256K, usb port, FTDI, wifly, 3V rele, Li-Ion battery. Esta entrada se publicó en barcelona, refarm y está etiquetada con development, electronics, hardware, materials, on mini vacations board, software en 10/07/2013 por hernani. Esta entrada se publicó en barcelona, refarm y está etiquetada con electronics, hardware en 29/05/2013 por hernani. on the left of the picture you have the prototype me and andreas built for the workshop. Esta entrada se publicó en paris y está etiquetada con art-residency, design, hardware, on nano vacations, structures, workshop en 20/05/2012 por hernani. Esta entrada se publicó en paris, refarm y está etiquetada con art-residency, design, hardware, structures en 18/05/2012 por hernani. Esta entrada se publicó en paris, refarm y está etiquetada con design, hardware, tools en 13/05/2012 por hernani. soon we will post some more pictures on how to make this board with cardboard and fabric! Esta entrada se publicó en refarm y está etiquetada con electronics, hardware, on nano vacations en 16/08/2011 por hernani. They first thing is wanted to change this time is the power supply. The ATX power supply hack is way too much for one sensor, too loud and too expensive. Too buy a 12 v leiser batterie that is connected to a solar pannel that recharges the batterie, is too expensive ( ding ding ding ) . So i decided to use old electrodomestic transformers. I picked up three different types all of them 12 Volt and amperes from 400 mA to 60mA and payed 2 euros each. I took a sony which a chinch ending , a langelsbold with a handy plug ?? and a matra with a network plug. The first one i tested was the sony. I cut of the plug and there where just 2 wires. The measuring was 18 V. 6 Voltes more then expected( cheap multimeter proberly too ) . I workd well with the 12V waterpump from the windshield cleaner and it worked well with the electrovalve 12 V. In use or standby it gets slightly warm , which means it is not of the newest generation and that it consumes a little standby energie. The Langenselbold didnt worked? I really dont know why. I did a short search on google where it comes from and i found nothing. I appearas that langensbold is a town in germany. The Mantra adapter with the network plug was i big suprise. You can power 2 pumps with on transformer. The foure wires are coloured black, yellow, green and red and the work in pairs. The output voltage was similar between the 2 possible solutions. Grenn + yellow with 14,5 Volt and black and red with 13,6 Volt. On the transformer is written that it powers the 11 V with 60 mA. That is significly lower then the Sony , but it worked well with the LED, pumps and electrovalve. So conlusion , just look for the voltages and it should be fine. Reuse old transformers is cheap and good and re:farm . You can power your devices easily with the wanted voltages. The current is stable and safe. With the ATX power hack i alwayes had short circuits and it was annoying to work with. When you just work in one range of voltage a AC/DC transformer can be the choise to go for to power your selfbuild things in a clean , cheap and save way up. Esta entrada se publicó en paris y está etiquetada con electronics, hardware, on nano vacations, project en 08/08/2011 por andreas. So after beeing occupied with a lot of other things i can spent some time on the re:farm proyect. A friend and re:farm member left me her flat and to do the watering of here plants. We suggested to use that time usefull and do some humidity sensor testing. 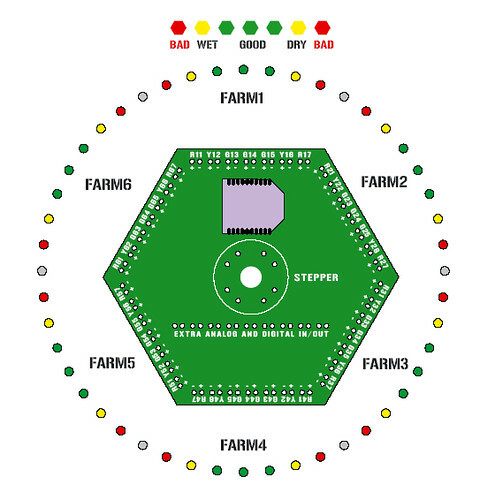 The re:farm nano board that includes the new sensor techology will be produced in november. Till that i will try to do it without to get more dates about reactive time and calibration of the system and think about electricity for teh parts. Esta entrada se publicó en paris y está etiquetada con hardware, materials, on nano vacations, project en 08/08/2011 por andreas. são paulo report and some considerations. we try this one here in são paulo. the nano vacations. don’t let you misleading by the nano scale. ok, it’s small (the diagram is 1/1) inexpensive 2$+ecofootprint, and can be mostly scavenge in a city. still on the scale perspective and scales we don’t see, most of our electronics work on micro, nano or pico scale but the above inexpensive ecofootprint can be bigger than the 2$.. can be a 2K$.. we just don’t know.. I didn’t make the maths on the energy embodied nor the ecological impact of our tools.. how many tons of minerals are dig from mountains and were are this mountains? we extend the live of some materials but we also use a small % of new materials. so we just setup the watering system without the nano blasting board. located here and by the bytes changed with pixel, the last day of the workshop was on the garoa hacher space. wau, what a place.. full with electronics, friendly people and geeky too :) being geek is one of the most intensify intellectual activities in our days apart of fun, open and creative. thank’s guys ;) you will be a great partner of the SP re:farm group. back to the small, pretty board: the idea is just to have some control over a system that has a bottle that recovers rain and a windshell water pump that handles the watering. the moister sensor (has a tribute to this guys) was made with local materials. we got this boxes on a country fair around the corner. Esta entrada se publicó en refarm, são paulo y está etiquetada con design, electronics, hardware, on nano vacations, workshop en 08/06/2011 por hernani. Esta entrada se publicó en refarm y está etiquetada con design, development, electronics, hardware, on mini vacations board en 06/05/2011 por hernani. So it definetly works!!! My depest repect to you Mr. Medici. Your self automated watering sytem is the best low budget automated watering sytem and it beats all comercial products. 10 John Meda simplicity points for your design. I definitely fall in love with it :). What i have seen is that it took nearly 49 houres for the plant to consume sufficent water and to overcome the hight distance between pressureswitch and ceramic sensor to do the switch. To do the reverse operation it took nearly 50 min or to be less precise 1 hour. I handwatered the plant with about 400ml of water , directly , no dripping system. Thats the next point about this system. If it is indoor it must be precise , otherwise you water your carpet too. This will be relationated with the tubes-diameter, folds and switches inside the system, the kind of valve and pressureswitch, the waterpressure, the hight of the watertank etc.. But it is not a real problem you can addjust all this parameters with the height of the pressureswitch. Esta entrada se publicó en paris y está etiquetada con design, electronics, hardware, on nano vacations, project, tools en 12/04/2011 por andreas. Till i find out how the wiring is done for the pressure switches i decided to make a little test about the response time of the system. What i want to find out now is, do that really works at my place with my parts and how much time my plant needs to drink the water from the switch and does it switches. If this is done I will water the plant by hand and i will see if the process will be reversed and the switch will go back in his OFF state. The plant is a present from a friend of us and I have no idea what typ it is, but I very happy with it and sometimes when I’m out I give here a place next to the window to enjoy the day. I watered that plant in summer at here house and it is a very thirsty type. In a previous posting about the ceramic sensor i found out that the plant consumes about 15 ml in 24h. ( proberly, I didn’t measured they water amount , because i dont have that equipment ). I filled the switch and the sensor with water , and it is imposible ( with my tubes etc… ) that you dont have air in the system, but i think that that will not be a problem. So i filled everything. The switch made click. It just takes a little amount of water, my tubes are very small, so i think the system is quite responsive. What I forther did was to water the plant a little around the sensor. As you can see in the foto the water passed the earth and a little stayed in the groundplate. What I have seen then is that the earth absorbed that water during one hour into the system and that made the bubbles in the tube move down( 2 cm) . So it looks like that he system is really good responsive :). One point more , the switch is 40 cm under the flower pot, that is importend , because the system and the pressure relates to the difference in height from the sensor to the switch. Esta entrada se publicó en paris y está etiquetada con electronics, hardware, materials, on nano vacations, project, tools en 22/02/2011 por andreas. The 2 differnt types i bought and i have no idea how they really work, but with the help of the internet I found out that one of them is from a dishwasher and not from a washing machine. With a multimeter I made a continuity tests and it looks like that one is having 1 trip points and the other is having 2 trip points. Here is small video that explains pressure switches. Esta entrada se publicó en paris y está etiquetada con electronics, hardware, materials, on nano vacations, tools en 22/02/2011 por andreas. Esta entrada se publicó en paris y está etiquetada con development, electronics, hardware, on nano vacations en 22/02/2011 por andreas. So piece by piece we are moving forward, I had a another meeting with AAA, this time with Doina the cofounder of AAA and Leonard from Guerilla Gardening – Paris who is doing currently an intership at there office. Doina explaned me that she is definetly interested to make an automatic watering system. Something that we not proposed, because they are always at there Office. During the conversation we came, with the help of Leonard, with a lot of different solutions up, but we didn’t convinced ourselfs to a final solution. Leonard showed me a watering system that is commonly used in Paris that i didn’t know before. It works with capillerty of ceramics and is basically the modern version of the ceramic mug in the earth. In Paris I have seen in the balconies plastic bottles standing out of the flowerbeds and I wasn’t really sure what this is all about. There a several types of that ceramic watering system and you can find them easily by goolgeling. During my study of that ceramic system I came across a paper by an brazilien agriculture scientist named Leonardo Oliveira Medici. He and his team developed a automatic selfwatering system that uses ceramic water purification capsules as humidity sensors. You can find the whole text here. Since measuring humidity with electric conductivity is not always satisfying I will try to install that system. AAA allready developed various drip gravity watering systems, so for there future proyects it could be a good and easily to assembly solution and could be used in there backyard. The foto shows a comercial ceramic watering system that i bought ( 5 Euros) and the consume of water by a single plant at roomtemperatur during 24h. Esta entrada se publicó en paris y está etiquetada con development, hardware en 17/02/2011 por andreas. refarm the city project was invited to participate on the development of ecoLAB, an initiative of plantaformacero born at LABoral art center of gijon. it’s a one year collaborative project were we are going to develop some tools for urban farmers. but the best part is that we will not be alone :) great guests were invited: andy gracie, susanna tesconi, the guys from zoohaus, cova dos ratos, our friends maki, rubén and other collectives from spain. Esta entrada se publicó en gijón, refarm y está etiquetada con hardware, invitation, tools en 02/02/2011 por hernani. by traveling from city to city I find different sources of the stuff I need, different ways to get to them and big differences on how its each city manage the inputs and outputs of resources. one of the outputs that we have been very concerned here on re:farm is the organic material that a city produce and it’s mostly wasted in big cities. more than wasted, is being mixed with paper, plastics or glass making the “eventualy” recycling process even more painfully. all the organic material produced by our kitchen, restaurants, markets and their super relatives are the raw material for your first step into farming. you need to get good soil and cheap and this is very easy and simple: our organic waste is food for worms and their waste is food for our vegetables. with this in mind we are gonna setup this new mega composter at Andes and monitor the life of the worms and friends. Esta entrada se publicó en new york, refarm y está etiquetada con art-residency, composter, design, hardware, materials, tools, wiki en 30/08/2010 por hernani. New boards have arrived! ready to go, whoop! Esta entrada se publicó en new york y está etiquetada con electronics, hardware, materials, on mini vacations board en 27/08/2010 por Basak Haznedaroglu. Greetings! I’m happy to make my introduction here on the Re:Farm blog. 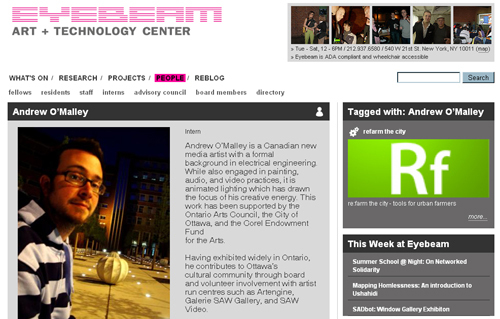 My name is Andrew O’Malley and I’m a Canadian artist/engineer. My main artistic interests are animated lighting installations and fixtures, and electronic music production and DJ’ing. These interests have brought me to NYC for the summer of 2010, where I’ve connected with Hernani’s Re:Farm project through his residency at Eyebeam. My first objective is to create the PCB (circuit board) for the Re:Farm On The Wall module, a data visualization module using an LED display to present data away from the computer screen. Ideally, the board will also incorporate a stepper motor to drive a needle (like a speedometer) for an additional data channel. I’m going to first concentrate on the LED display. Since the board will make use of an ATMEGA microcontroller (Arduino) chip and an XBee radio (to receive the data), real estate on the approx. 3″ x 3″ board is already a bit tight, so I am currently researching Charlieplexing, an LED driving scheme which allows N*(N-1) LEDs to be directly driven by N pins of the microcontroller. 8 data pins from the microcontroller can thus be used to control the 48 LEDs since Charlieplexing with 8 pins allows control of up to 8*7=56 LEDs. At The Next HOPE conference this past weekend, Jimmie P. Rogers was demo’ing and selling his LoL (Lots of LEDs) Shields for the Arduino. He has a great post about his work with Charlieplexing which I’m currently consulting. Talk about serendipity! In a way, the overlap between the needs of Hernani’s project and my own interests in lighting and internet-enabled lighting fixtures is serendipitous as well. Esta entrada se publicó en new york y está etiquetada con electronics, hardware, project, software en 23/07/2010 por andrew. I haven’t paid for it till now, so i dont know the price for it. Just to mention that. It comes naked with all the parts that you can than later sold onto it by yourself. Quite a funny task. I had hardly ever solded electronics chips, something that is quite small and fine to work with. Generall i had a littlepit of respect for that small electronic parts, at least for the digital parts. They break easily, or at least you think, but this is something that changes when you get used too working with them. It changes from esoteric to something quite physical, which i think is a good step ahead. The solding is quite simple. I followed the manual made by hernani. Now with the wiki it is way more easy i think. I just solded one part wrong. The electronic parts look quite the same and the diagram hernani made was usefull but strange but true – one photo says more than a diagram:). Solding the card is quite an easy task and you can make it all in one day easily whitout any previous knowledge. The testing is a bit more complicated. I have a basic knowlede of adruino and electricity, but something simple how do i plug this thing in needs his own tutorial, but with the help of hernani we made the first testing with my waterpump and my re:farm on vacations board is ready to let it rain. The foto shows hernani, with my card hooked up to the powersupply of an old computer and the waterpump from my car that found his final rest in a car cementary here in Barcelona. Rest in peace Astrobotnia , at least some of your parts get reincarneted in an urban garden. That is quite a good afterlive. Esta entrada se publicó en paris y está etiquetada con electronics, hardware, materials, on mini vacations board en 02/04/2010 por andreas.